Millennials have been accused of many things but the one thing we're not given credit for? Forever changing the way people communicate. With Chinese New Year round the corner, this contrast is even more jarring when you're trying to find common ground with your older relatives because adulting is so difficult. And let's be real, most are just there for the "dollar, dollar" bills. 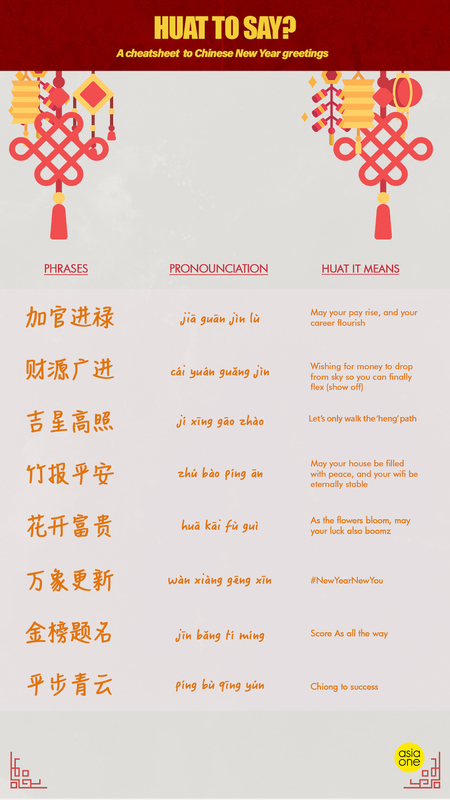 So, to help solve your first world problems and get 'turnt' for the festivities, AsiaOne is here with a cheatsheet of Chinese New Year greetings that you can use to navigate those pesky conversations and show how 'woke' you are. Feeling utterly 'shook' about how to use or pronounce these greetings? Fret not, because this handy video will provide some practice and put your skills to the test. Now that you have your very own millennials' guide to Chinese New Year greetings, it's time to dispel the perception that you're 'basic' and 'ratchet'. Get lit and go slay!